Monk Agog: Vice Versa Box Set Of God®… Made By Other Hands! 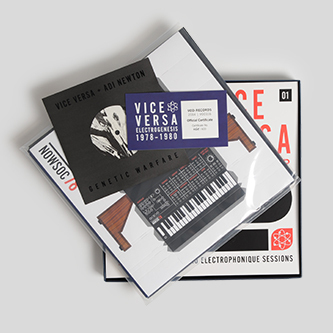 Over two and a half years ago, I happened to have a friend send me the über rare first two releases by the Sheffield band Vice Versa, who later became ABC after a suitable period of metamorphosis. I thought that I was lucky to have these records; especially as gifts! Late last year, I then caught wind of the least likely thing that I ever would have expected to happen to this obscure [some would say derided] Sheffield band who were absolutely towing the parochial line in their earnestly dour “minimal synth” stylings before finding their funk and becoming worldwide pop stars of a gold lamé stripe. German [of course, they’re German] boutique label Vinyl On Demand has now created a boxed set of god® featuring not only all of the seven tracks they ever released on three 7″ singles and EPs, but enough archival material and alternate version to explode into a 4 x LP box complete with a bonus 7″ single! They’re copping my riff! What does it have? Words…fail me. Here were a band with about 20 minutes of hyper obscure released material and Mark White and Stephen Singleton have curated this excavation of their distant past for the world [or at least 600 pairs of ears] to hear. And the resources have provided for an abundance of almost three hours of material to listen to. Did I say they copped my riff? No. I merely would have been canonical with the seven released tracks. This is beyond canon with 47 tracks accounted for. And they still had to throw in a bonus 7″ single! We need those stinking badges! The design of the package is most deluxe to accompany so much music. The embossed box comes with five vinyl discs, a numbered certificate of authenticity, a sharp metal badge with the Neutron Records logo as seen at left, a 40 page booklet of liner notes and photos, full color printed inner sleeves on the LPs, and the piece that puts this completely over the top: a build-it-yourself paper synth model as seen in the photo above. Now, how much would you pay? VOD has kept the price rather low for all of this merch. It retails for €74.99 but those of us residing outside of the EU pay no VAT, so I could buy this for only €63.02 [$69.88] and shipping. Which would probably be more than the €12 VAT, but who’s counting? Would I like this package? Oh yes, I certainly would. As I imply, it’s the sort of labor of love that I would create [albeit on CD-Rs] if I had access to all of this material. That it’s vinyl instead, I would be happy to deal with as it will hopefully trump even the clean vintage records that are in my Record Cell. They only made 600 of these and released it last November, so I expect that it will be sold out in a few months, but for now, it can be purchased here. 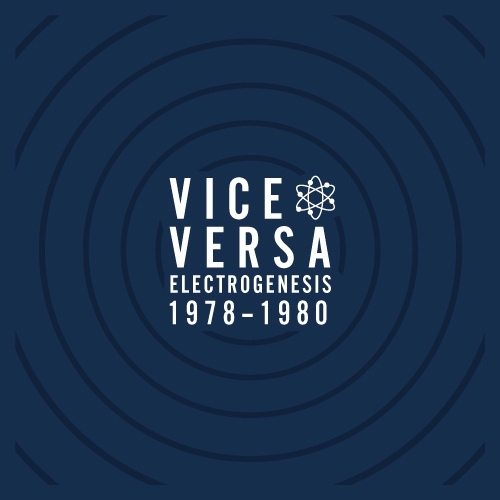 This entry was posted in Badges, Core Collection, Want List and tagged 2014, ABC, boxed set, Electrogenesis 1978-1980, Sheffield, Vice Versa, Vinyl On Demand. Bookmark the permalink. 13 Responses to Monk Agog: Vice Versa Box Set Of God®… Made By Other Hands! still not right mister ! Nick – WordPress v 4.x is the handiwork of Satan! A draft written six months ago should have today’s date stamp if published today, don’t you think? I actually fixed the problem with brute force while you were posting! Trust, me, it was buried back in December 2014! Do I want this? YES!, Will I get this…hmmm…possibly. Echorich – I echo your sentiments. I already have 6/7 released tracks. Are they fun? Yes! Moreso now, I do believe, than they would have been in 1980. Do I need a core dump of Mark White’s audio archives? Not necessarily, but this looks so well done that I am mentally capitulating, in theory. Will I have the $80-90 to buy this any time soon, and it should be sooner than later… probably not, knowing my budget! Next payday, my $20 mad money is probably buying my ticket for the Ohio Players! 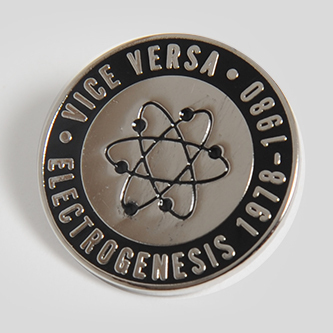 By the way, “Electrogenesis 1978-1980” is exactly what I would have called this had it actually been my handiwork. Spooky! It is a brilliant title! I do have to say that Vice Versa gets very short shrift for their, abeit limited, electronic contributions, but they were spurred on by the same wave of modernism that infected much of Sheffield toward the end of the 70’s and into the very early 80’s. Is it fair to compare them to Human League, Cllock DVA, Cabaret Voltaire, yes it is. They played the same clubs, were informed by the same sounds and each other. Vice Versa just didn’t get around to releasing as much as their contemporaries before morphing into ABC. 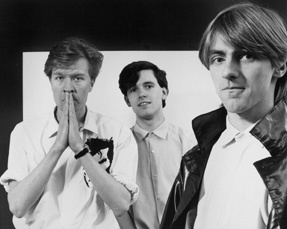 I can listen to Eyes Of Christ and I hear the same influence which showed up in The Cabs and Human League. New Girls Neutron is cut of the same cloth as Human League and Gary Numan for that matter. Genetic Warfare is very relatable to Clock DVA and Adi Newton even had a go at mixing Vice Versa. MEIN GOTT IN HIMMEL! What a find! So interesting to hear a group at the very beginning of their original musicianship working out how its done by creating more of what was around at the time and then later finding their own path. This has made me want to own a record player again more than usual! I have to admit to the horror of the purists who might read this that I’d love to see this released on CD, but I respect the choice to make it vinyl and will have to contemplate the cost to own a BSOG *not* made by the Monk! chasinvictoria – We might get lucky. In spite if their moniker, Vinyl On Demand have occasionally produced CDs, though who knows what their criteria was in those cases! I’m just pleased that a boutique label is putting the care that I put into a project on a real, commercial set! We need more obsession to create astounding releases like this! And at the same time – not really sure about this release. Firstly, it’s really an overkill. Like you, I was really puzzled, didn’t know they had so much to offer in their archives. But more inportantly, a friend of mine had once bought a (as it turned out) bootleg LP called something like “Democratic Dancebeat”, which had all the official VV releases (including tracks from their cassette of 1980) crammed on one record. Frankly I’ve found it hard to sit through in one sitting – not that I didn’t know it isn’t easy listening of any kind, but… I feel this kind of music is rarely suited for long form releases. Of course there are quite a few very wonderful “minimal synth” LPs – but overall the time limitations of the 7″ were for the best for this genre. With this one, as much as I love and highly regard VV as electronic pioneers, – do we really need demos? Well, one or two would be fun but not all of them and from several studio sessions. And live recordings of underground artists are rarely of great quality. In short, I think it could’ve been a, say, (terrific) double LP with all the originally released stuff and those unheard songs. But FOUR LPs are a bit too much. Though, of course, “Vinyl on Demand” specialize on this kind of deep archival digging. Last (but not least) – I’ve had a chance to hear a couple of the tracks from this one and the opening “New Girls/Neutrons” puzzled me as it differs from the version I know and love, like a slight remix. Have to get myself aquainted with this release more closely, but this was a warning sign for me – too much of the modern re-release stuff botch that precious original sound. The badge looks delicious, though. Want! Have you seen the wonderful documentary “Made in Sheffield”?It has lots of footage of Vice Versa gigs and features all the classic bands of that era,Human League,Cabs,Artery,Vice Versa etc. Gavin – Nice to know I’m not the only Monk who had taken vows of poverty. The sad thing is, it will never be cheaper than it is now, I suspect. As for “Made In Sheffield,” no I have not, and this is a tragedy of small scale as I collect so many Sheffield bands… with the exception of Artery, whom I need to hear. The sad thing is, I’ve only heard of them in the last five years. I’m led to believe that they are right up my alley.